You work hard for your gold, And you deserve to get top dollar for it. I enjoy mining for gold more than just about anything else I can think of. I also enjoy getting new people involved in prospecting and helping beginners become successful. One question I am often asked by people new to prospecting is “Where do I sell my gold once I find it?” You work hard for your gold, and you deserve to get top dollar for it. So we’ll answer that question, but first, let’s look at some facts you should know about gold before you try to sell it. Gold is an actively traded metal which is used in jewelry, contact points in computers, communications satellites, as a shield against radiation in the glass of a space helmet–even in your telephone. The price per troy ounce for which gold trades, or the “spot” price, changes and is set daily in the various financial centers of the world such as London and New York. You can find out what the spot price is by checking the financial section of most large newspapers, TV news, or by telephoning a precious metals dealer or stock broker – or even by going to the home page of this web site..
Gold bars or coins are usually pure 24 Karat gold, also called .999 fine (meaning 99.9999 pure). When you buy gold coins or gold bars, you usually pay a bit more than the spot price. Likewise, when you sell coin or bullion, you are usually paid a little less than spot. That’s how the dealer makes his profit. Some terms you need to be clear on are karat and carat, and fine. Karat is used to express the pureness of gold. 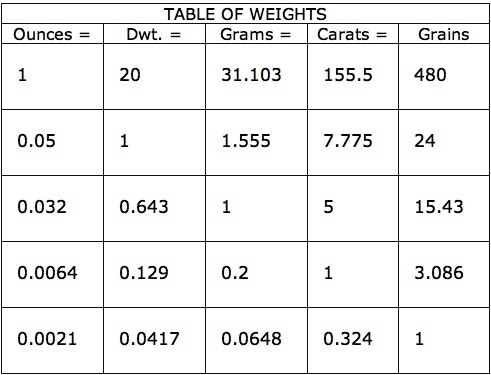 Carat is used to weigh diamonds and other precious stones. One carat is 1/5 of a gram. Twenty-four karat gold is 100% pure gold. Fourteen karat gold, the form which most jewelry items are made of is 14/24 or 58.% pure gold. The rest of the metal determines the color of the alloy. Fourteen karat white gold is 58.3% pure yellow gold and 41.7% nickel and zinc, which give it the white color. Fourteen karat yellow gold is 58.3% gold mixed with equal amounts of silver and copper. Mix 41.7% copper with gold, and you get 14k red, or rose gold. Mix 41.7% silver, and you get 14k green gold. So the amount of added metal determines the karat, and the type of added metal determines the color of the gold alloy. Fine is a word used to describe both the purity of gold and the size of individual grains of gold. It expresses purity when a decimal appears before the word fine. For example, .583 fine means 58.3% pure gold, or 14k gold. .999 fine is usually used to mean 99.999% pure gold. This is as pure as we can get gold or just about anything else for that matter. But when someone says “fine” gold (no numbers mentioned), they mean small flakes or gold dust. Small gold particles are called fine gold because thy will pass through the holes of a very fine mesh screen. Placer gold is never pure gold. Gold is always found as a natural alloy. It runs anywhere from 50% on up to 96% pure gold. Fine gold of .750 to .870 is the most common. The rest is usually silver, but there can also be other metals alloyed with the gold such as platinum, copper, nickel, iron, etc. Pure gold can be obtained from natural gold by refining it electrochemically. Electrolysis is used to put the gold into a cyanide solution. Other metals fall out of solution to the bottom, and gold is pulled back out of solution eletrolytically as pure gold. There really is a market for all the gold you can find. So what is the best way to sell it? That depends on how fast you need to sell it, and upon how much you want to get out of it. Usually if you need to sell it fast, you will end up with less than if you can take your time and sell it with some value added. For a fast sale, just about any pawn shop will be glad to buy your gold from you for 50% of spot or less. This would be my last choice. There are people who will pay more for it. Some people make their living, or at least part of it, buying and selling placer gold. You should find out who these people are in the area where you live and in the area where you mine. They will usually pay you cash on the spot for your gold, and pay anywhere from 70% to 90% of spot for fine gold. Some pay more for nuggets, but many do not. 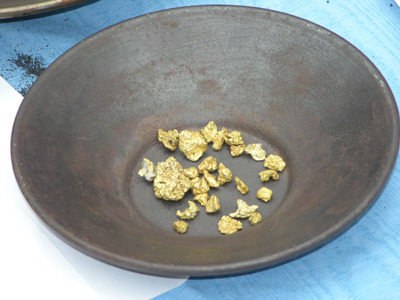 Jewelers who use gold nuggets in their jewelry designs will often pay more for nuggets. There are people who specialize in buying and selling gold nuggets of exceptional size, shape, or quality. Also there are private nugget collectors who are always in the market for unusual and beautiful nuggets. The best way to find out who these people are in your area is to ask experienced miners who buys nuggets. Other places to make a fast sale are coin shops, precious metal dealers, and some refineries. Most of these places will want to have your gold assayed to determine its purity, and then they will usually pay around 90% of spot for the actual gold content. As an example, let’s say that you have one ounce of .873 fine gold to sell, and spot is $476/oz. You actually only have .873 ounces of gold. The rest of the weight is silver or some other metal. They will pay you .905 of spot, or 428.40/ounce; and $428.40 X .873 ounces = $373.99. That’s about what you can expect to be paid by someone who needs to make a profit from the gold they buy from you. So how can you get a better price for your gold? By selling to the final consumer, and by adding value. The final consumer is someone who intends to keep the gold just the way he or she buys it from you. They don’t intend to refine or resell it. They want it to keep as a specimen, a souvenir, a jewelry item to wear, etc. And by making your gold up into souvenirs, specimens, or jewelry, you add value in addition to the value of the gold. So first let’s discuss what you can do with your gold and then where you can sell it. Natural placer gold nugget jewelry is very appealing to a large segment of the public, and therefore fairly easy to sell. Nuggets can be made into necklace pendants, earrings, tie tacks, etc., by soldering on 14k gold findings with gold solder. This is an obvious choice if you are an experienced jeweler, but not so likely a choice for someone with no jewelry background. In future articles I will be giving step-by-step instructions on how to become a goldsmith, and how to mount your own nuggets even if you have no previous experience in silversmithing or goldsmithing. But for now, epoxy is probably a less threatening idea than gold solder. Small nuggets and fine gold can be mounted with epoxy glue onto small jewelry-size gold pans, small Austrian crystal, or sterling silver charms by anyone with a steady hand. These are available through mail order or from your local mining supply dealer. No matter which you choose to mount your small nuggets on, the technique is the same. Let’s use a small blued steel gold pan hat tack for example. Surface oils keep epoxy from sticking to any surface, so you must remove all of it, even finger oil. Get some acetone from a paint or hardware store, and immerse the pan in it for 10 seconds. Remove, and wipe it off with a paper towel. Press the pin into some styrofoam to hold it in place. Use tweezers to arrange your nugget or nuggets in the pan until you find the arrangement that looks best to you. Remove the nuggets one at a time, and rub the back of the nugget across 320 grit emery cloth or silica carbide sand paper to create a flat rough spot for gluing. Then mix up some epoxy with a toothpick on a small sheet of wax paper. Use slow-drying epoxy if you are gluing quite a few at a time, or quick-drying if you only plan to do a few. Be sure to mix it thoroughly. Super glue is not recommended. Pick the nugget up with tweezers, and touch a small amount of epoxy to the flat spot you ground on the back. It looks best if the glue does not puddle around the nugget, so apply it sparingly. Also be careful not to get any glue on the tips of the tweezers. Then place the nugget where you want it in the pan, and let the glue set up. The same procedure can be followed to apply nuggets to Austrian crystal or sterling charms. The blued steel pans and antiqued sterling findings look best when finished with a spray coat of polyurethane varnish, available at hobby stores. Fine gold usually needs some cleaning before you use it. It must be free of black sands, and any mercury should be removed. If the gold is dull, you can shake it up in a vial with some dish soap and water to brighten it. Fine gold can also be mounted into blued steel pans and sterling mountings. Decide where you want the gold in the pan, and use the toothpick to put epoxy into the pan in the shape that you want the gold to be. Sprinkle fine gold onto the epoxy spot, and arrange it with a dry toothpick until you get it to look just right. After the epoxy sets up, spray it with the polyurethane varnish. You could use fines on the Austrian crystal, but they really look better with single small nuggets. It’s easy to mount small nuggets and get them to look good and sellable. It’s harder to come up with jewelry that looks appealing with the really fine gold. And, you usually have a lot more fine gold than small nuggets, so you would like to be able to use a lot of it in good-looking jewelry. One advantage in using the miniature blue steel gold pans is that the fine gold really looks better in these pans than small nuggets do. It is more to the size scale of these small pans than small nuggets, so it looks great in them, and these pans are available for every type of jewelry item you could want to make, including necklaces, earrings, hat and tie tacks, cuff links, and even belt buckles. Another good use for fine gold and small nuggets is to work them into a belt buckle with a mining scene on it. Here again, use epoxy and finish with a polyurethane spray. Look for buckles at mining supply shops and mail order supply houses. You can glue the gold into the prospector’s pan, the stream bed, and eagles’ claws, etc. Large gold flakes and small nuggets can also be used to make lockets. Lockets can be made by finding coin mounts at a jewelry supply store and buying watch crystals the same size. You can get sterling silver, gold filled, or 14k gold coin mounts for US gold coins, Mexican gold coins, etc. Then find watch crystals that measure the same diameter as the gold coin for which the bezel was designed. You need two watch crystals for each necklace or earring you wish to make. You can also buy these as complete sets ready-to-use from several mail order suppliers and from many local mining supply shops. Also available are small decorative glass bottles which can be filled with gold for necklace pendants or earrings. The gold goes into the hollow space between the two crystals, and then the bezel is tightened around them and holds them together. The bezel usually has a small screw at the top which is used to tighten it around the crystal. The bezel holds the crystals together when closed, and glue is not necessary. If you choose to glue the two crystals together use epoxy, and use as little as possible. If it runs, there is little you can do to make the piece look good again. Never use super glue. Some watch crystals are plastic and the vapors from super glue make clear plastic turn white and fogged. Gold flakes look best when displayed in water, but it is not easy to successfully fill watch crystals with water. Air bubbles in the water and leaks at the seal between crystals are common problems. But if you like a challenge, start by using distilled water. Tap water has minerals that settle out of solution as white flakes; distilled water does not. Boil it first, to drive out all the dissolved air, them fill and seal a quart bottle, and put it in the refrigerator to cool. This keeps small air bubbles from forming inside the crystals after the glue dries. The crystals must be glued together under water with the gold and no bubbles in them. The glue must seal them together with no leaks, yet not show too much either. After the glue sets up, and if there are no leaks, they can be put into bezels. You can also get decorative small glass bottles deigned for use as earrings or necklace pendants. Cooled boiled, distilled water should be used in small glass bottles also. Jewelry is not the only way to add value to your gold. You can sell glass vials containing a small amount of gold as mineral specimens or souvenirs. Glass vials are available in several different sizes, but the two dwt., ½ ounce, and one ounce sizes are the best for selling small amounts of gold. The gold should be clean of black sand and mercury as in the jewelry. Start by setting a per ounce price for your gold. I charge more per ounce for small amounts than I do for quarter or half ounce in a vial. Next, decide what price you want your vials to sell for, and weigh out $3, $5, $19, etc., worth of gold at your price. For example, if you decide to charge $800 per ounce for small amounts, and you want tomake up a $5 vial, you need 5/800, or 1/160th of an ounce. There are many different types of scales and balances you could use for weighing. You could use a pennyweight (dwt.) scale, or a gram scale, or one graduated in grains or carats. The units don’t matter, but the scale must be sensitive to very slight weight changes. The example given of 1/160th of an ounce is .125 dwt, or .194 grams, or 194 milligrams, or 2.75 grains, or .97 carats. A table is provided for weight conversions, so that whatever type of balance you have, you can make it work. I use the two dwt vials for up to $20 worth of gold, the ½ ounce vials for $19 to $50, and the one ounce bottles for $25 to one ounce of gold. Since you can get close to 90% of spot for your fines from a gold buyer, it makes no sense to sell it this way unless you get spot or spot plus 10% at least, even for a full ounce. After weighing the gold, put it into the vials, and fill with distilled water. A good trick to eliminate bubbles in the ½ ounce and one ounce vials is to put the cap on the vial while holding both under water. Bubbles will not appear later on if you use boiled, chilled water. I made up an attractive card to help in selling the small two dwt size vials of gold. It has a drawing of an old prospector panning and of a modern suction dredge in operation on the front of the card. Both sides of the card are full of scientific and geological information about gold. It also tells about the history of gold mining in America. The vial of gold gets glued on the front of the card, with clear silicone rubber sealant. I use them for $2, $5, $10, and $20 vials of gold, and they really help sell the gold. At gold shows, I find they especially fascinate grade school kids, who can usually talk mom or dad into spending $3 on something which is so educational. I also use the card with small nuggets. You can purchase and use my cards for your small vials, or make one of your own. If you do take the time to make a card, be sure to copyright it. It only costs $10 to copyright. If you wish to learn how to copyright your work, write to Copyright Office, Library of Congress, Washington D.C. 20559, and ask for copyright information. They will send you everything you need free. Some more ideas for souvenirs are as follows: You can buy or make ceramic or cast metal sculptures of a prospector with a gold pan, and glue some gold into the pan. The metal ones can be made to use as automobile hood ornaments or paperweights. You could make up a prospector doll with a small gold pan in his or her hands, and glue gold in that. Use your imagination! 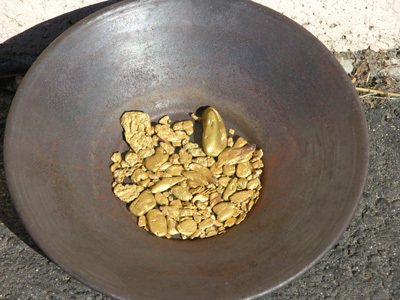 If you can come up with something related to prospecting that prospectors or the general public would buy, and work your gold into it, then you can usually get at least double spot for your gold. So where do you sell jewelry, vials of gold, and souvenirs? Friends, relatives, and the people you work with are a good place to start. Just bring what you have made to work with you and show it to people. I know of one guy who sells all he makes in bars. He just pulls his stuff out of his pocket, shows it around, and it sells. Next try selling to the public at shows. Swap meets or flea markets are an inexpensive way to show your gold. If you have enough jewelry, vials, and souvenirs made up, also consider setting up at gold shows, rock and gem shows, county or state fairs, etc. If you have enough profit built into your price structure, you can consign your goods or sell wholesale to retail shops that sell to the public. Some good shops to approach would be local mining supply shops, rock shops, etc. Also tourist shops, gift shops, and jewelry stores in areas with a gold mining history. Here again, use your imagination, and you will find shops which will be happy to carry your gold. There is one final option which we have not yet discussed. You can keep it. There are several ways to do this also, and some good reasons to consider this option. Many people are sure that the price of gold will rise much higher than it is now in the not-so-distant future. The spot price has, in fact, been steadily rising for the last few years, with an average gain in price of about $4 to $7 per month for the last 18 months. So if you hold onto your gold, you may get more for it in the future. There is some speculation involved here, but most economists seem fairly sure that gold prices are more likely to rise than fall in the next few years. Many people also expect the collapse of the United States and/or world economies in the future; some in the near future. I am not a doomsdayer, but let’s consider the advantages of holding large amounts of gold if it were to happen. Dollars wouldn’t be worth the paper they’re printed on, and stores wouldn’t take your money. It would be worthless, and rich men would be broke. But what if you had gold? You would still have something to exchange for goods and services which is recognized as being of value. You would still have purchasing power, while all around you had none. A financial collapse may be fantasy. But whether it occurs or not, there are some definite advantages to holding your gold. First and foremost, your gold is not subject to income tax until you sell it. When you sell it, you are required to report what you sell it for, less what it cost you to produce, as income. 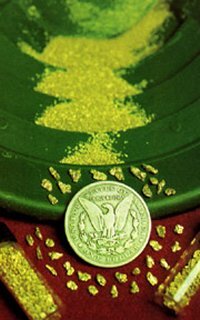 Placer gold is not pure gold. It is still just gold ore, very high grad ore, but just ore. And mining companies do not have to pay income tax on ore taken out of the ground that is not yet refined and sold. There was a time, not so long ago, when citizens of the United States were not allowed to own refined gold. But unrefined placer gold was still legal to own because it was really just a high grade ore. If such laws were to return, placer would probably still be legal to own. Finally, most of us miners get a natural high from handling our gold, and showing it off to close friends. It’s a reminder of all the good times and hard work that it took to get it. I take a lot of pride in my gold. I just plain like the look of the stuff, and the memories that some of those individual nuggets bring back: Good friends from Washington state that I met in Idaho dredging’ the day I capsized my dredge on the Klamath; my wife jumping up and down all excited at her first nugget. I have individual nuggets that bring back memories of all these incidents, and more. Those are some pretty valuable reasons to hang on to some of your gold. No matter what you decide to do with your gold, I wish you success with It.